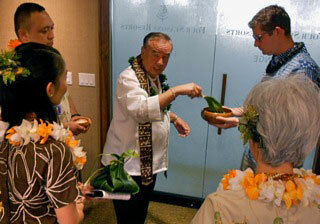 A traditional Hawaiian blessing performed by Kahu Silva for the grand opening of the Four Seasons Resorts Lāna`i luxury lounge marked the first hotel-branded lounge in Hawaii. The 1,000 sq. ft. space located within the Honolulu International Airport’s interisland terminal, offers state-of-the-art amenities to pamper the weary traveler. Kahu Silva wore a red kihei which is the traditional formal Hawaiian ceremonial attire. The color `ula`ula red symbolizes Hawaiian royalty and is also sacred to the ancient Hawaiian god Kū, the first of the four major ancient Hawaiian deities to arrive in Hawaii. 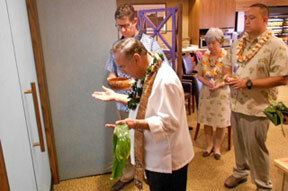 Pa`akai (rock salt) traditionally used to bless, cleans and purify, was collected from Lāna`i, wrapped in sacred green la`i (ti) leaves and hand-carried were Kahu mixed it with pa`akai from O`ahu during the ceremony. 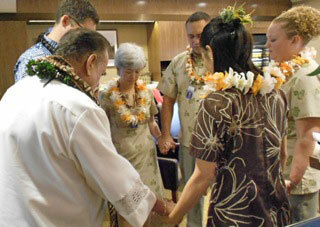 When the god Kū first stepped foot in Hawaii it was on Ku-moku, Lāna`i. The land trembled with violent earthquakes, whirlwinds whipped the kai (ocean) into a frenzy, and great boulders were tossed about like pebbles. This was the mighty Kū-nui-a-kea (Kū-the-supreme one) in his many kino lau (earthly forms) in nature. He established himself as the protector of all of Hawaii and it’s people and was known as Ku-ke-olo`ewa (Ku-the supporter) and regarded as the war god of the ruling chiefs, he was revered as Ku-kaili-moku. He is known by many other names which are descriptive of his many manifestations in the environment: Kū-ka-lani-`ehu-iki (Kū the heaven’s sent spray) and Kū-ho`one (Kū-pulling-together-the-earth). Worshipped as the god of farming, he was Kū-of the digging stick and lawai`a (fisherman) prayed to kū-of-the-abundance of the sea. Kū was significant to medical practitioners, kumu hula (hula teachers), canoe makers, feather gatherers and other practitioners. Ancient Hawaiians avoided the island of Lāna`i in the belief that it was the domain of man-eating spirits who were controlled by the sorceress Pahulu. 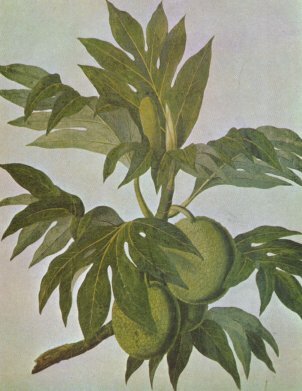 In the 1,500ʻs a mischievous prince named Kauluā`au committed the destructive prank of pulling up every `ulu (breadfruit) tree he could find on Maui. To punish him, Kauluā`au’s father Chief Kaka`alane`o, banished him to Lānaʻi. Everyone thought he would not survive because for 500 years no human had ever stayed overnight on the island and lived to tell about it. With the help of his ancestral `aumakua (guardian spirit), brave Kauluāʻau cleverly outwitted the ghosts and drove them away. Chief Kaka`alaneo rewarded his son’s heroic feat by giving him full control of the Lānaʻi. People from the other islands were encouraged to settle there since Kauluāʻau made it safe for habitation. Later Chief Kaka`alane`o learned that while on the island, Kauluāʻau had pulled up all of the `ulu trees.